All photos were taken by either Ellen or Scott, unless otherwise noted. We arrived in Barcelona on Tuesday afternoon, October 7, to perfectly lovely weather, and took the train to the Plaça de Catalunya. From there it is a short walk (long enough, with our suitcases on our backs) to the Hotel Jardi, through the Ciutat Vella, or old city. The hotel is at the junction of two small squares, the Plaça Del Pi and the Plaça de Sant Josep Oriol. It was a perfect location, if a little noisy. We went up in the towers at both ends. If you look in the center between the towers shown here you'll see the bridge we crossed. Only one of these towers had been completed at the time of Gaudí's death in 1926 (he was run over by a tram). The church is awesomely cool and inventive, from the structure to the ornamentation. We watched the workers, and tried to figure out all the wacky construction techniques they were employing. Thursday we walked up the hill called Montjuïc, or Jewish Mountain. Ellen wanted to see the 1986 reconstruction of Mies van der Rohe's Barcelona Pavillion from 1929. We also saw some of the 1992 Olympic buildings and the Castell. We rode all kinds of transport, from a funicular to two different teleferícs (aerial trams). On Friday we went to Parc Güell, also by Gaudí, which is a quite bizarre and interesting failed development that is now a city park. ...but we made it back to Plaça del Pi in time for an excellent, simply excellent organ and soprano concert at the Basilica de Santa Maria del Pi just across the square from our hotel. After a while in Catalunya we began to get the hang of the Catalan language, at least to recognize some written words. Most of the place names in Catalunya are in Catalan, and all the signs were in both Catalan and Spanish. ("Exit" is salida in Spanish, sortida in Catalan.) 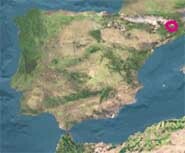 Catalan is a Romance language, and for some words the resemblance is greater to French than to Spanish. During our stay in Barcelona we enjoyed las Ramblas at all hours of the day and night. One night we had a little late supper on La Rambla dels Caputxins at the Café de L’Opera, across from the Gran Teatre del Liceu. Another night we walked the whole length of all las Ramblas, including the new Rambla de Mar that extends out into the Mediterranean Sea. On Saturday, October 11, we checked out of the hotel, picked up a rental car at the Estació Barcelona Sants and left the big city, driving along the Costa Brava. At first the drive is quite flat, marked by continuous development separated from the beach by a railroad track and highway. But then we got into more interesting terrain and had our picnic lunch on a charming little beach in a cove with high granite walls and tourmaline water. In Girona we enjoyed a late evening ramble along the Passeig de la Muralla, the ancient city wall. We stayed at the Hotel Condal. In the morning we wandered Girona's La Rambla looking for cafe con leche, croissants and the internet. Then it was off to Figureres, to the Dali museum, where we spent the better part of Sunday afternoon marveling at the unfathomable imagination of this weird and adaptable artist. And on by winding mountain roads to Ripoll, where we spent the night at la Casa Paula. On Monday, October 13, we drove to Lac des Bouillouses (a.k.a. La Bollosa) to hike the Tours des Estanys (the Lakes Loop) in the Carlit Massif. It's a pretty mountainous drive much of the way from Ripoll, and we had to stop in Puigcerdà to book a hotel for the night, so in classic fashion we were hitting the trail at about 2 p.m. – and it had just begun to rain. But the area is beautiful - slightly reminiscent of the high Sierra in California, with lakes and tarns dotting the terrain of glaciated granite. On our way in we saw several people coming out, bailing on account of the rain. We were well prepared, and persevered, and the rain let up enough a couple of times for us to get a good view of Pic Carlit and some of the surrounding Pyrenees. We ate our lunch in one of two little green metal huts along the way - not exactly pleasant but at least out of the rain! It was wet, wet, wet. On the way out we were overtaken by a party of five young men from Belgium who were on their first day of a five day trek, and who had come over Pic Carlit in the worst of the rain. We ran into them again when we stopped to see if the Auberge Carlit would give us a beer and some food before we headed back down to Puigcerdà. The innkeeper spoke only French, so Ellen had a chance to test her high school language skills. We spoke English with the Belgians, they spoke Flemish among themselves and we all spoke French with the innkeeper. The view of the station from our hostal window. The next morning Ellen discovered a delightful free funicular and public elevator between the station (down low) and the town (up high). After breakfast we left Puigcerdà and headed for Espot, the gateway to the Parc nacional de Aigüestortes y Estany de Sant Maurici in the Catalan Pyrenees. Along the way we decided to take a side trip to check out a tiny village called Cava that, on our map, had only a footpath leading to it. It turned out there is both a footpath (one of the GR trails, from its red and white markings) and a road, 7 km of twisting one-lane road. We were passed by only one car, going down as we went up, and saw no one but cows when we reached the village. We stayed overnight Tuesday at the Refugi de Amitges, in company with three women from Colorado and a Catalan couple. Only the "unguarded" part of the refuge - a little hut - was open. In season, the bigger part shown here is open and staffed, and meals are available. On Wednesday, October 15, we had a fabulous adventure climbing over one of the high mountain passes. Our detailed map showed a trail, but it turned out to consist of a few haphazardly placed cairns. Our way took us into a beautiful glaciated granite cirque, charmingly full of small lakes. We saw some isard, the Pyrenean chamois. In our usual fashion, by the time we were hiking back out of the park it was pitch dark. We spent Wednesday night back at Casa Felip. ¡Otra vez (again)! On Thursday we headed south in the car toward a small Romanesque cathedral that we read about in the book Wild Spain, at Roda de Isabena in Aragón. Along the way (A-1605) we drove through a narrow slot gorge where the road went through a long series of short tunnels. Because there was no traffic (except one beater Citroën in a half hour) we were able to park and look down at the gorge. The rock in this area had very interesting tilted layers. We passed through Serradúy, a town where the buildings seemed to merge into the rock. Roda de Isabena was "off to the side of the side road," at the top of a long hill, so there weren’t a lot of tourists there besides us. When we arrived it was pouring rain, and water cascaded down the steps leading up from the parking lot. The electrical wire and antenna in the photo are the only clues that you're not in the Middle Ages. The caretaker of the cathedral was kind enough to open it up for us, and though she didn’t speak English, there was a cheat sheet translation of the tour for us to follow as she showed us around. Driving back down from Roda de Isabena we could see an interesting place where water seemed to be flowing out of the rock hillside everywhere. (It was still raining.) Following a back road for many kilometers to see if we could reach it, we ended up in a tiny hamlet called Esdolomada, where we spoke with a very nice farmer. He seemed stunned by the idea that Scott couldn't understand Spanish at all. (He supposed we might be from France? No? Estados Unidos! Ah!) He confirmed what our map told us, that the narrow road we were on ended five km on, at the town of Merli. Further, we would find nothing happening in Merli at this late hour (it was nearly dusk). We turned back, and stopped to look at these twisted rock layers with water pouring out. Ellen saw a fox here! But the camera was too slow to catch it. Farther down the road crossed a marked trail, and we followed it for a little ways and discovered yet another cool slot canyon. Then on in the dark across Aragón. We got a room for the night in the town of Ayerbe so that we could get a look in the daylight on Saturday morning at Los Mallos (the Mallets), some cool welded tuff cliffs and towers similar to our own Smith Rock. There were a few climber dudes there. By taking the toll road, we made time across rainy Navarra and into the Basque country, and spent a sunny Saturday afternoon (October 18) in Donostia-San Sebastián (Donostia is the Basque name and San Sebastián is the Spanish name for this beautiful city). We roamed the old town, listened to an opera-singing busker, climbed Monte Urgull, walked on the beach and sat by the esplanade watching the world go by. We arrived in Bilbao late that night, and (after a wee bit of trouble unloading the car) we checked into the Hotel Abando, by a lovely park just a short walk from the train station. We liked Bilbao's new streetcar, EuskoTran. On Sunday we had two great visits to the Guggenheim and walked the river walk, crossing the newest pedestrian bridge to get this view of the museum. 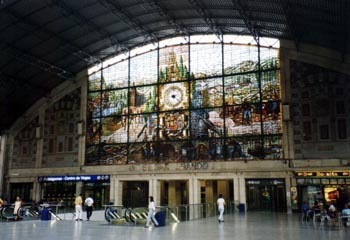 This photo of the Estacion Abando in Bilbao is borrowed. Sunday night we took an overnight train to Madrid to catch the Monday morning train to Granada. When we boarded the train at 11:05 p.m. in Bilbao, there were only two coaches and an engine. But through the night we kept meeting up with and being joined by other cars from other towns, so that by 7:30 in the morning when we got to Madrid we were a great long train. This photo of the inside of a sleeper is borrowed from the RENFE website. Ours was a little different, but had the same neatly folded red plaid blankets! Our sleeper compartment had many interesting features, including a window that rolled down so Scott could stick his head out the window (despite strict injunctions against same). Our compartment was high, with little steps up, a coach seat and two bunks above. There was a little sink that could be covered to make a small table, and little lights all over the place. It was quite a comical scene when we hung our still-damp laundry in the tiny compartment. But with the window open as we chugged along it dried nicely. 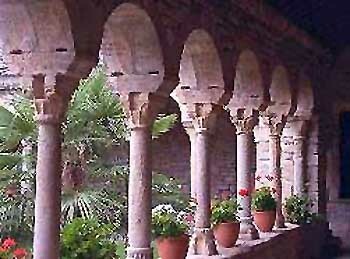 Monday afternoon, October 20, when we reached Granada, the weather was sunny and fine. We checked into the Hotel Vincci and set out on foot to get the lay of the land. After lunch under the trees in a small plaza we visited the gardens of the Alhambra and enjoyed the water features of the Generalife. Tuesday was a rainy day in Grenada, which is not very usual, and we were glad to have spent Monday’s sunny hours in the gardens so we could concentrate Tuesday on the indoor spaces of the Alhambra palaces. Tuesday evening we met up with José Luis Spinola, of the International Center for Urban Studies. He gave us a nice guided walk around the old city. Scott was enchanted with the two door handles on the Ayuntamiento, or city hall, which each depict a golden hand holding a fruit. "Is it an apple?" we asked José. It is a fruit like an apple, called a granada, he told us. Granada is named for this fruit. This is the season for granadas. The next day we asked for unas granadas at una fruteria. Familiar red fruits were proffered - pomegranites. "Apple of Granada!" Scott exclaimed. On Wednesday, October 22, we picked up our second rental car in Granada and drove up into the Sierra Nevada, to La Alpujarra Alta. We found the Sierra Nevada very different from the Pyrenees. We stayed two nights in Trevélez, a little white town perched high in a valley, famous for curing hams. Horses seem to be comfortable on its narrow streets. We spent Thursday hiking up the mountain in the direction of Mulhacén, the highest peak in Spain. We went up a path through terraced fields shaped by Moors in the 1100s or so to raise all kinds of fruit (some say the terraces were made even before that in the 4th century BC, by Celtic-Iberians, before the Romans came). Now they are mostly full of cows with horns and bells. The cows make a beautiful music as they graze. We had to shoo some off the trail so we could pass. The trail crosses several acequias, or irrigation channels, that capture water from the high mountain streams. We reached las Chorreras Negras (the Black Downspouts), a series of amazing waterfalls that have carved their way down through black shist. We had hoped to get up to the la cañada de las Siete Lagunas, (a cirque with seven tarns) but the day was running out, so we contented ourselves with playing in and about the spectacular falls. In our usual way, however, we tarried long and found ourselves trudging back into Trevélez in full dark. From Las Alpujarras on Friday the 24th we went west to see El Torcal, incredible limestone formations of cliffs, columns and tortured totems. It was a foregone conclusion that Scott would climb these rocks. We saw a whole herd of mountain goats who leaped and frolicked on the high rocks. We even saw little kids nursing, so sweet. The limestone layers are varying depths around the formations. These looked to us like stacks of pancakes. I especially liked the "roll of coins" tipped over. We pressed on in time to view the Garganta del Chorro in the last fading light of day. This is a totally awesome gorge, but to see the best of it you have to walk through four railroad tunnels. Parts of the gorge wall are bolted, and in between two tunnels we met some British climber dudes. The most amazing thing to see is the decayed Camino del Rey, a catwalk that runs along the whole gorge. We came to a bridge of the Camino over the 200' gorge that is still relatively intact, and of course Scott had to cross it! 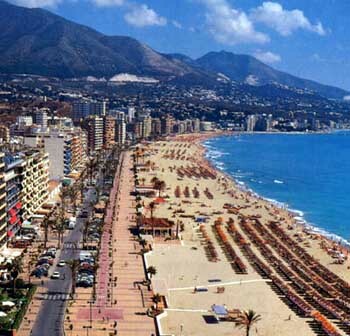 We spent the night in the Costa del Sol town of Fuengirola, in the Aparthotel Veramar, and despite the rain, wind and high surf on Saturday morning, we took advantage of our last chance to perform a total immersion in the Mediterranean before passing Gibralter on our way to Tarifa. We didn't take our camera to Tanger - traveling light! 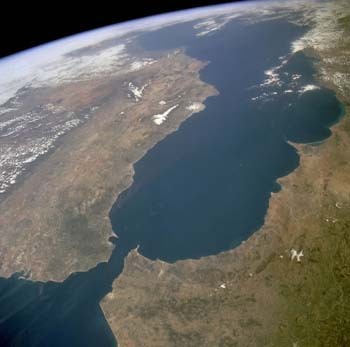 - so we've borrowed this satellite photo that shows just how close the southern tip of Spain (Tarifa) is to the northern tip of Africa. 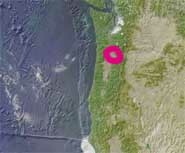 North is to the upper left. Gibralter is that little excrescence from the north side at the eastern end of the strait. We could see Africa even before we got on the ferry. On the afternoon of Saturday, October 25, we made a successful foray into Africa. We took a fast ferry from Tarifa, the southernmost point of Europe, to Tanger, Morocco. The sea was very rough and Ellen got motion sick - along with a lot of the other passengers. Scott called it a big barf-in – and by the way, he wasn’t sick. In Tanger we enjoyed a tour of the Medina and souk with local guide and con man, Mohammed. It was very interesting, but we were not there to buy anything, much to Mohammed's disappointment (as well as the disappointment of his many friends to whom he introduced us - the carpet man, the spice man, the leather man, the jewelry men, etc.) The sights, sounds and smells were definitely foreign. It was a bit of a rainy afternoon, but after our tour with Mohammed we enjoyed going out on the beach, where a man was offering camel rides. Ellen dipped her toes into the African Atlantic. 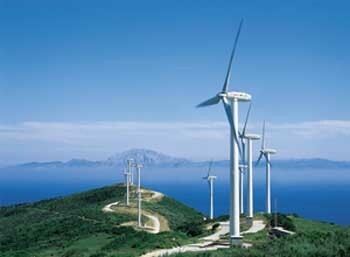 We borrowed this picture of the windmills near Tarifa, too. You can see Africa across the Strait of Gibralter. The evening ferry return to Tarifa was much less eventful than our earlier passage - thank goodness! Many people (but not Ellen!) were actually consuming food on the ship. Back in the relative safety and comfort of Spain, we spent the night in Tarifa at Hostal Facundo in company with many young windsurfers, who no doubt found the wind and high waves to their liking. Coming and going from Tarifa, we saw how the locals put the wind to work - massive windmill farms! With cows grazing below the whipping blades. On Sunday, October 26, we drove to Sevilla, where we spent the afternoon visiting the Cathedral and the Alcazar. The gardens of the Alcazar are quite lovely. We were astonished by the number of brides we saw! Being photographed in the Alcazar seems to be a requirement for Sevilla weddings. We explored the 1929 exposition grounds and Plaza de España and sat out a thunderstorm having lunch in a restored Muslim bathhouse. This beautiful patchwork art by Curra Marquez was one of the pieces we saw at the exhibition. Then we drove through more thunderstorms to Aracena, where we spent a comfortable night at the Casa Manolo. This is a nice, clean little town with children playing soccer in the central square, a ruined castle on the hill, an unfinished cathedral, and – just our luck to stumble on - a fascinating temporary exposición of quilts in the visitors center. The woman who spoke with us there turns out to be Mirvia of Almonaster la Réal in the province of Huelva, as I discovered on the web. Thunderstorms dogged our drive into Portugal on the morning of Monday, October 27, but we found one dry picnic area along the road where we could break out the camp stove and have a little tailgate picnic breakfast under a cork tree. We arrived in Lisbon just in time to avoid another day on the rental car. We found Lisbon quite different from the cities we visited in Spain. The sidewalks everywhere are made with small fist-sized cobbles, mostly white, some black and white designs. A flexible but labor-intensive system. The houses and buildings are often tile-faced. We especially enjoyed walking around the Alfama district, where the streets are narrow - some even just wide enough for one person and many with stairs - and the entrance of cars to the district is strictly regulated. On Tuesday we began by visiting the Estufa Fria, an exotic garden with a greenhouse effect created with a wood slatted roof. Many tropical plants thrive here, and some of the trees are growing right through the roof. This is in the Parque Edward VII, across the street from the Hotel Rex where we were staying. We also visited the restored castle and the cathedral. The weather in Lisbon was changeable, with some rain every day, but we cleverly managed to stay dry by riding the trolleys and funiculars everywhere they go. It is astonishing what narrow roadways the trolleys can go through! And they go both ways on this track - though not at the same time. On the last day of our adventures, Wednesday, October 29, we took the light rail line out to Belém to see the tower and monastery. 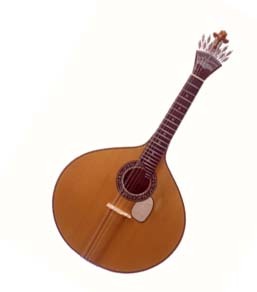 The Portuguese guitarra has a flat back and twelve strings. This is a borrowed photo..
That evening we walked back to the Alfama district to the restaurant Guitarras de Lisboa. Our goal: to hear fado, the traditional Portuguese style of ballad. We were just finishing our dinner when the lights dimmed and two guitarists took up their instruments, one the Portuguese guitar. They played a tune, and then Romy stepped forward. (She and António Mendes are the featured performers in this tastefully furnished dining room.) The guitars began, and Romy gave us our first taste of the wailings of love, loss and longing that are fado. Our journey on Thursday, though long, was as uneventful as anyone could wish. Ever faithful to our theme, dusk found us trudging uphill from the bus toward home, suitcases on our backs for the last time, grateful for the liberties we enjoy, and eager for the comforts of the familiar once more.